Let me start by saying these tarts are insanely good. I dare you to try and eat just one, you can't trust me. 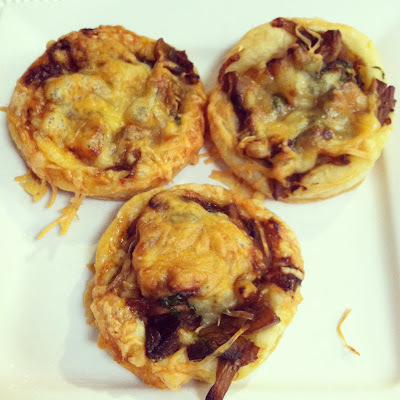 These would be great to serve at a party but I ended up making them for lunch when I had my friend Katie over. I served the tarts with a Citrus Kale Salad and it was in my humble opinion the perfect lunch- well perhaps a glass of chilled white wine would have made it better. You can cut the tarts as big or as small as you like. I used my second largest biscuit cutter which is approx 3 inches wide. I thought the tarts were the perfect size not too small or big. I see these tarts being made very often in my future! You could honestly do any toppings but the mushrooms, onions, and Gruyere pair together perfectly. These little tarts are melt in your mouth good! 1. Preheat oven to 400 degrees F and line two baking sheets with parchment paper. 2. Heat the olive oil in a wide, heavy-bottomed pan over medium-low heat and add the onions. Cook, stirring occasionally, until they begin to caramelize, about 20 minutes. 3. Add the butter to the pan. Once melted, add the mushrooms and saute, stirring occasionally, until they are completely soft and all of the liquid evaporates, about 20 minutes. 4. Add the garlic and the thyme and saute until fragrant, about 1 minute. Season with salt and pepper to taste. 5. Add the wine, scraping the bottom of the pan to pull up all of the browned bits, and cook until all of the liquid has evaporated. Remove from heat. 6. Unfold the thawed sheets of puff pastry and cut out circles from the dough, placing them evenly spaced on the baking sheets. Using a very sharp knife, make four small scores around the perimeter of the dough, about ¼ to ½-inch from the edge. 7. Top the rounds of puff pastry with a small spoonful of the onion and mushroom mixture, trying to keep the filling within the score marks. Top with the shredded Gruyere cheese. Brush the edges of the dough rounds with the egg wash.
8. Bake until the pastry is golden brown, about 15 to 25 minutes. Garnish with fresh chopped parsley. Whoa. These have my three favorite things... Can't wait to try! Oh my mouth is watering! I love anything with cheese and these are calling my name! I will def be making these! Maybe this weekend for me and hubs! holy crap, I saw these on pinterest last week and have been thinking about them ever since. Can't wait to try to make them (or have Matthew make them so they'll actually taste good)! I have been making something similar to this from Paula Deen but instead of biscuits the base is grits. It is so insanely good!! Another recipe I must try! ok, this looks super yummy! Thanks for sharing! Ummm, my mouth is watering!!! Cannot wait to make these and I want the recipe for your citrus kale salad!!! These tarts are INSANE! The salad was out-of-the-grading range delish, as well. And, I agree with Natalie--THE perfect lunch! Thank you, again! Ooo yummers!! This looks divine! Something hubby and I both would love! 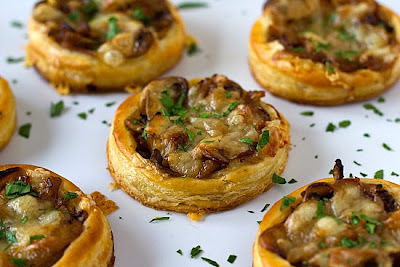 Oh my, I just did asparagus tarts and I have left over puff pastry and mushrooms. SCORE!! Lunch today. sounds delish... i made something similar but w/o the cheese! Can't wait to make it! Looks delicious! I'm making the baked hummus and spinach dip for my book club tonight can't wait ! Contempo + pomegranate seeds= HEAVEN! This is making my mouth watery just looking at it! YUMMY.